Yesterday we enjoyed a short walk onto Stanton Moor from the village of Birchover. As well as being carpeted in beautiful purple ling heather, there are also a wealth of interesting features on the moor to marvel over. Stanton Moor is believed to have once been a very special place to our ancestors. In Bronze age times the landscape would have been very different with fertile farmland, and timber roundhouses scattered over the area. Evidence has been found all over the moor of field boundaries, burial mounds, and stone circles. 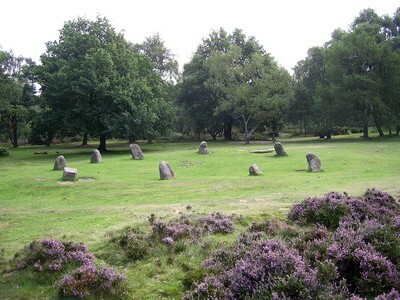 The best known stone circle is the Nine Ladies. Local legend has it that nine ladies went up to the moor to dance on a sunday and took a fiddler to play them music. All were turned to stone as they danced in a circle as a punishment for dancing on the Sabbath. The King Stone outside of the circle was the fiddler. Another fascinating feature on the edge of the moor is the Earl Gray tower. Built by a local man to celebrate the passing of The Great Reform Act in 1832, which gave every man the right to vote. A visit to Stanton Moor wouldn’t be complete without passing by the aptly named Cork Stone – an outcrop of local gritstone. It is covered in graffiti, some of which dates back to the 19th century. Footholds and metal hand holds were also added in the 1800’s to enable it to be easily climbed.